Wolong National Nature Reserve is a protected area located in Wenchuan County, in the Sichuan Province in China. It will take about a four hour drive by car from Chengdu city, to reach the park, which is situated at the foot of the Chionlay Mountain. Founded in 1963, the natural park extends over an area of about 200, 000 ha, mainly occupying the eastern foot of the mountain. Wolong Nature Reserve is situated in the transitional area between Qinghai, the Sichuan Basin and the Tibetan mountains. Since 2006 Wolong has been part of the World Heritage by UNESCO. Unfortunately, because of the numerous tourist visits and population growth and interference, the reserve is facing an unprecedented threat. Using satellite imagery, experts have calculated that the rate of destruction of the park is now higher than before its creation. 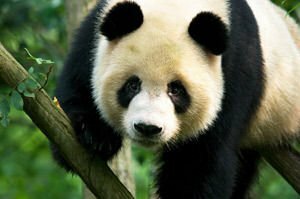 Human influence here has a negative impact on the largest value of the reserve - the famous giant panda population, which are endangered. There are about 1600 representatives of the giant panda or lesser, also known as red pandas living in the territory of Wolong Nature Reserve. The only way for the species to be protected, is with the breeding center that was built in the early 80s of last century. Worker representatives at the breeding center, rear then release the animals into their natural environment. Among other duties, the park also cares for injured animals, as well as providing specimens to various zoos. The center has become a school, where anyone can be trained how to breed wild animals. Among other fauna in the territory of the reserve are over 50 different species of mammals and 300 bird species. 29 endangered species are kept in Wolong National Nature Reserve. Besides the animals here, one can see the incredible beauty of the various 4, 000 species of plants that bloom in all different seasons. It is best to visit the reserve in Spring, from April until May.